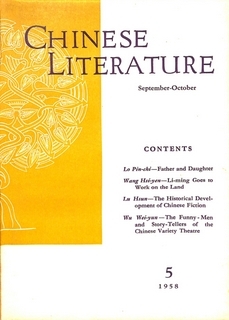 Lu Hsun was considered the writer to emulate even before the Declaration of the People’s Republic by Chairman Mao in October 1949. Once state power had been achieved he was very often referenced in the pages of Chinese Literature – both his stories and essays on the role of literature in Chinese society. 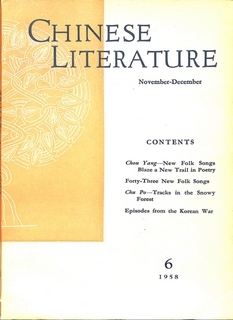 Issue No 5 for 1958 includes an article attacking the North American writer Howard Fast (famous for his novel Spartacus – among others) for the reasons he gave on leaving the Communist Party USA. There were also Supplements published with the two magazines reproduced here containing political statements by the Party Leadership. 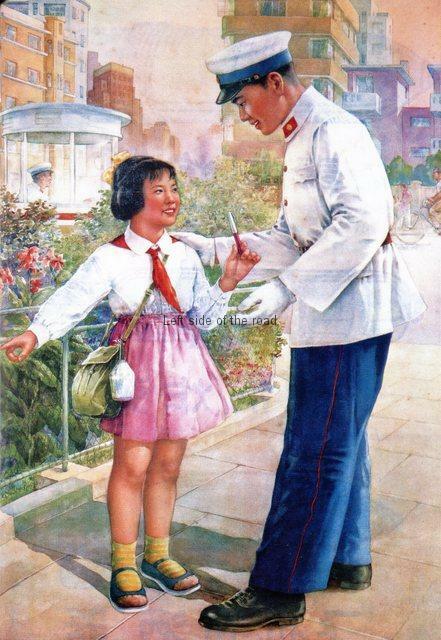 This became a common situation as all those publications published by the Foreign Languages Press in Peking would distribute such statements to as wide a readership as possible. 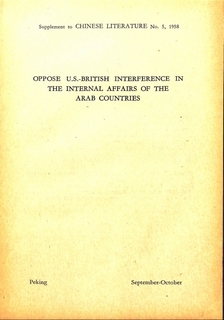 Oppose US-British interference in the internal affairs of the Arab Countries – specifically in Lebanon (the US) and Jordan (the British). Also praising the establishment of a Republic in Iraq. 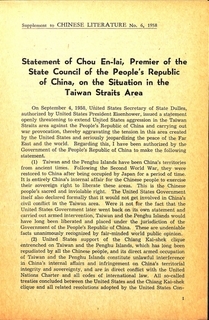 Statement by Chou En-Lai, Premier of the State Council of the People’s Republic of China, on the situation in the Taiwan Straits Area.